Famous Nigerian indigenous rapper, Olamide Adedeji alias Badoo may be at risk of a N3 million fine and one-year jail term for allegedly encouraging the use of tobacco in his recently released video, ‘Wo’. The federal ministry of health, via its twitter account, had notified the public that the rapper had violated the 2015 tobacco act, warning that the video had “dangerous public health content”. 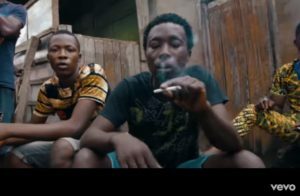 The rapper, had returned to Ladi Lak in Bariga where he grew up to shoot the video of his latest single but the ministry of Health claimed that the video which features ghetto scenes in which youths are seen smoking, encourages second-hand smoking. The Federal Ministry of Health has warned the general public of the dangerous public health content and violation of Tobacco Ctrl Act in ‘Wo’ by Olamide which might attract the singer a penalty of 1 year jail term and a fine of nothing less than a million naira.